The Optical Communications and Sensor Demonstration (OCSD) project uses cubesats to test new types of technology in Earth's orbit. Two small satellites launched to the International Space Station Sunday (Nov. 12) to test a new laser-based, space-to-ground communication system and a new way for satellites to work together while in orbit. The Optical Communication and Sensor Demonstration (OCSD) is hitching a ride to space inside Orbital ATK's Cygnus cargo spacecraft, which lifted off from NASA's Wallops Flight Facility in Wallops Island, Virginia on an Antares rocket at 7:19 a.m. EST (1219 GMT) and is expected to arrive on Tuesday (Nov. 14) at 5:40 a.m. EST (1040 GMT). You can watch the rendezvous and docking live here, courtesy of NASA TV. The OCSD project "addresses two cross-cutting capabilities of value to many future small spacecraft missions: high-speed optical transmission of data and small spacecraft proximity operations," NASA officials said in a statement. Using lasers, these cubesats will be able to transmit data at rates of up to 200 megabits per second, "a factor of 100 increase over current high-end cubesat communications systems." Unlike previous laser-communication satellites, the lasers on these two cubesats are hard-mounted to the body of the spacecraft. This means that the entire cubesat must change its orientation to point the laser in a given direction. "This makes the laser system much more compact than anything previously flown in space," NASA officials said. The new satellites will also test out a new version of an ancient navigation technique: looking at the stars. 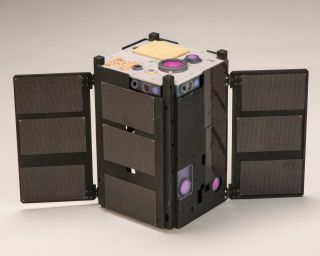 Each cubesat contains a miniature star-tracking device that is "expected to enable pointing to an accuracy of 0.05 degrees," or 20 times the precision achieved by previous cubesats, according to the statement. These cubesats will also test out a new system for detecting their proximity to other satellites. Together with a new water-based propulsion system, the new proximity sensors will allow the orbiting satellites "to operate cooperatively during science or exploration missions, to approach another spacecraft or object for in-space observation or servicing, or to connect small spacecraft together to form larger systems or networks in space," NASA officials said.